Interested in gardening but don’t have enough space? Woodberry has a Baltimore City Farm located in Rockrose Park. The farm is located at the old ball field site behind the play lot. 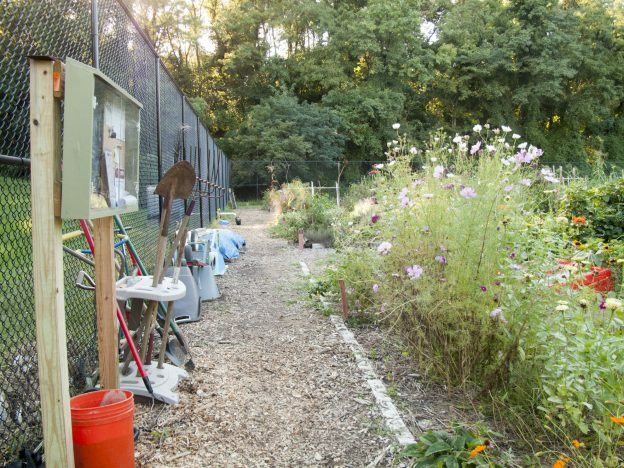 Baltimore City Farms is a Recreation and Parks program that offers garden plots for rent to City residents. The program is open to anyone who wants to garden, regardless of their level of experience. Most plots are about 150 sq ft, which is approximately 10×15 ft in size. The plots rent for $30 a year. All City Farms gardens provide water. Wood chips are also provided. The City Farms program began in 1978. Today there is a network of 11 City Farms with about 700 plots for urban gardeners. Baltimore City residents grow their own vegetables, herbs and flowers in the beauty and safety of city parks. For more information about the City Farms program, visit the City Farms page on the Baltimore Recreation and Parks website.